Online Registration Now Open for PATH Intl. Conference! It's only about 15 weeks until the 2012 PATH Intl. Conference and Annual Meeting, October 31 through November 3, in Bellevue, WA. We are working hard to offer you the best conference experience. That includes presenting stimulating and educational workshops in myriad tracks, including two new tracks: Innovate Track, where you will learn about the industry's future in exciting ways; and Equine Health and Well-Being Track, focused on our four-legged partners. There is plenty of fun in store in addition to the incredible lineup of presenters, including our keynote speaker Jim Bergquist and our closing reception band Bucking Horse. You won't want to miss a minute of the 2012 PATH Intl. Conference and Annual Meeting, October 31-November 3. Look for the registration booklet included with the Summer issue of PATH Intl. Strides. Click here to register online or click here to download the registration booklet. See you in a fast 15 weeks! PATH Intl. thanks Ride the Ducks of Seattle for the donation of four gift certificates to tour Seattle by land and by sea ("It's a Party on Wheels!"). We are always looking for quality items for the silent auction. If you know of a business that would like to donate a product or service to the silent auction or for the registration bags, or if you have an item you would like to donate, click here to download the form or contact Sandra Boe, the Silent Auction Chair. 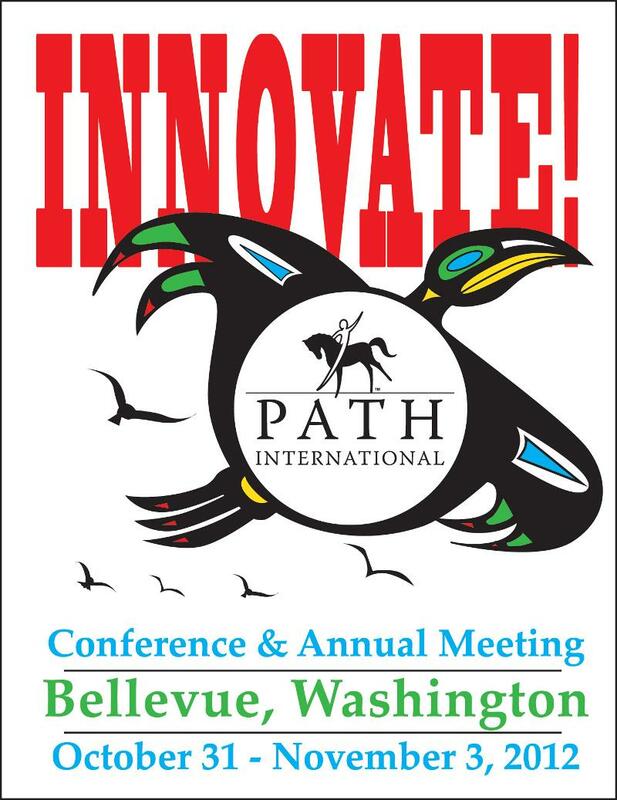 The 2012 PATH Intl. Standards for Certification and Accreditation are here! The 2012 PATH Intl. Standards for Certification and Accreditation manual is now available for members to download or purchase from the PATH Intl. website. All centers will receive a CD with their annual standards packet. This first phase of the multi-year standards reorganization process is complete. The continued work on the Standards Manual allows for growth within the equine-assisted activities and therapies industry without affecting our current activities and services. For more details, click here for frequently asked questions. Feedback can be provided to the Standards Task Force or by using the Membership Feedback form in the 2012 PATH Intl. Standards for Certification and Accreditation manual and mailing it to the PATH Intl. office. The PATH Intl. Equine Welfare committee will be hosting a series of free webinars on Best Practices for Equine Care. Attendance is limited to 25 per session so please register now through the PATH Intl. online store. The first webinar is July 22nd at 7:30 p.m. ET. Additional dates for the Best Practices for Equine Care webinars will be on August 27, September 16 and October 19. A task force has been formed that is working for you to review the certification system and processes. A diverse and inclusive group of volunteers comprise the task force, led by long-time member and past board of trustees president Teresa Morris. In an ideal world, each horse would have a "wardrobe" of his/her own tack, and that tack would change over time as the horse's weight and muscling fluctuate. In the real world, however, it's the rare PATH Intl. Center that has that luxury, and most of us do our best to fit the tack we already own to the horses in our program. There are many factors in the selection of tack for the EAAT horse, including what is available, what fits the horse, appropriateness for the abilities and limitations of the rider and suitability for the lesson plan. In this article, we will address fitting a basic English style bridle and a saddle. Subsequent "Tips" articles will discuss additional points about tack options and tack-fitting. Please share your thoughts, ideas and experience regarding tack fitting as well! Read more. The Equine Welfare Committee encourages positive and engaging educational exploration from our readers. We'd love to hear your feedback! Please let us know if you have any questions about our tip or have a suggestion for future topics. Email Kristin Mason, Equine Welfare Committee chair. NEW ANNOUNCEMENT: Please Join Us! We invite you to participate in lively, thought-provoking and sometimes controversial discussions on the online PATH Intl. Equine Welfare Community Connections group. No matter your specific interest (EFP, therapeutic riding, hippotherapy, carriage driving, interactive vaulting, etc. ), they ALL involve working with equine partners. This is the long-awaited resource for all PATH Intl. members to exchange ideas, ask questions, offer comments and suggestions, and "pick the brains" of some of our industry's most experienced and qualified people. Click here to access the forum. You will need to be logged in. Congratulations to the following new centers that joined PATH Intl. in June. We're excited to have you with us. The Morgan Stallion Astronomicallee, owned by C. A. "Tony" Lee III, is sponsoring two horses at the Equines Assisting Special Individuals (EASI), a PATH Intl. Premier Accredited Center in Jasper, AL. "Astro" is helping cover the care for "Gem" and "Samson" for one year. The sponsorships will help cover farrier and vet care, dental, special supplements, and anything else that the horses need throughout the year. PATH Intl. Instructor Laura Daley's book Riding Fear Free: Help for Fearful Riders and Their Teachers, co-authored by Jennifer Becton, has just been released. Much of what Laura shares in the book is from years of working with special needs children. She has been a PATH Intl. Instructor for 15 years. Congratulations, Laura! Attention Centers: Need New Ideas for Revenue? While we in EAAT have long touted the benefits of therapeutic riding for those with disabilities and challenges, the rise of equine-assisted learning is opening the eyes--and wallets--of a different clientele. Many spas are adding equine-facilitated therapies to their list of programs, along with massages and facials. Click here to read an article in the New York Times about two spa owners who discovered the benefit of partnering with equines. Please direct correspondence about this newsletter to PATH Intl. eNews coordinator. PATH Intl. eNews is a benefit of Professional Association of Therapeutic Horsemanship International membership. No portion of this publication may be reproduced by any mechanical, photographic, scanned or electronic process without written permission from PATH Intl. PATH Intl. reserves the right to reject, accept and edit submitted material. PATH Intl. eNews is intended as an information exchange and an opportunity for communication for members in the field of equine-assisted activities. The opinions, practices or products presented in PATH Intl. eNews do not necessarily reflect PATH Intl. policy, imply PATH Intl. endorsement or comply with PATH Intl. standards.